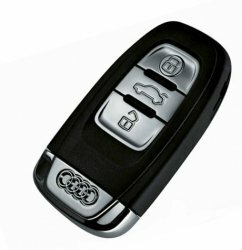 Use the Audi Look Alike Keychain DVR for instant and easy covert color video anywhere you go. This gadget is the best of it's kind on the market today and is great to use for gathering evidence for covert missions or for insurance disputes. Top-notch motion activation mode. Conserve battery and storage space by having the DVR only record when it detects motion. It is capable of recording continuously for 40 minutes, supports up to 16 GB MicroSD cards (comes with a 2GB card), and has a battery life of two hours. High definition video. True 720P resolution video ensures you capture all essential details.